Pennsylvania Gov. 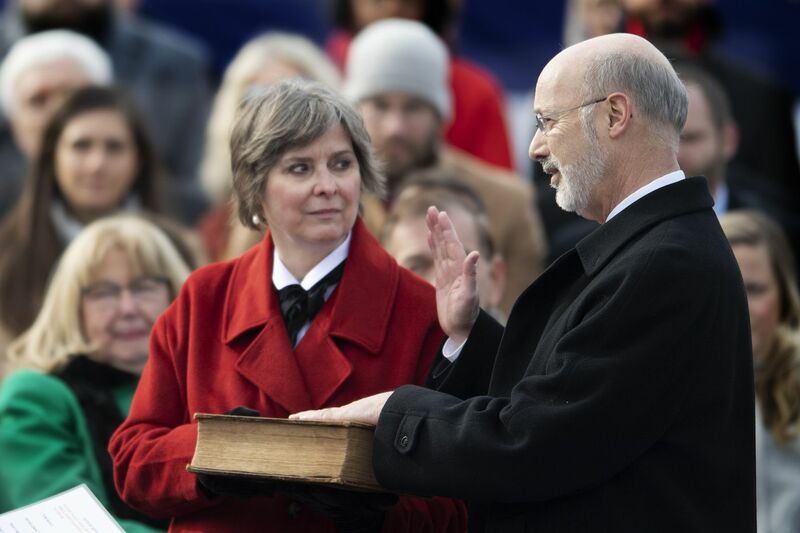 Tom Wolf, accompanied by his wife Frances, takes the oath of office from Supreme Court chief Justice Thomas G. Saylor, as he is sworn in for his second term, Tuesday, Jan. 15, 2019, at the state Capitol in Harrisburg, Pa. But Wolf, 70, avoided specifics about his priorities for the next four years, sticking to broad descriptions of what he considers progress: continuing to increase funding for public education, creating opportunity for residents to find jobs, and working toward criminal justice reform. “Today, I ask you to choose hope over hopelessness, empathy over apathy. I ask you to choose action over passivity,” Wolf said. He took the oath of office from Supreme Court Chief Justice Thomas G. Saylor, using the Wolf family’s mid-19th-century Bible. Though Wolf was the main attraction at Tuesday’s inaugural events, which were to culminate in the evening with a party at the Farm Show complex, all eyes early in the day were on Lt. Gov. John Fetterman. Fetterman, 49, the former mayor of a down-on-its-luck steel town near Pittsburgh, is often described as one of the state’s most unconventional elected officials, in both looks and persona. Unabashedly progressive in his views, he has spent much of his political career advocating for reducing poverty and bolstering equality, regardless of the zip code of one’s birth. Until Tuesday, his trademark wardrobe consisted of jeans or cargo shorts and a Dickies-style work shirt. But he swapped that for a charcoal suit, white dress shirt, and black tie for his swearing-in ceremony in the Senate. In his remarks on the Senate floor, Fetterman struck a similar tone to Wolf, pledging to strive for “a spirit of bipartisanship” as his wife, Gisele, and their three children looked on. He made a point of introducing his general-election opponent, Republican Jeff Bartos, as a “dear friend." Still, reality may not be quite as smooth. Wolf and Fetterman still will be dealing with solidly Republican majorities in both legislative chambers. Though the GOP lost seats in the last election — largely ones held by moderate Republicans in the Philadelphia suburbs — the returning legislature is expected to be more conservative. How Wolf, once characterized as America’s most liberal governor, maneuvers around that new political landscape will be watched closely. In his speech Tuesday, Wolf said he wanted to commit to combating discrimination against the LGBTQ community, fighting climate change, and further improving voting access and security. Still, among the governor’s first challenges will be the state budget. A recent analysis by the state’s Independent Fiscal Office projected a $1.7 billion shortfall in the fiscal year that begins in July. In an interview Tuesday afternoon, Senate Majority Leader Jake Corman (R., Centre) called Wolf’s speech “well done.” He said he wasn’t bothered that the governor stuck to broader themes rather than outlining an agenda. “That’s the way it should be,” Corman said. “It’s a day for Pennsylvania. It’s a hopeful day. A day of ceremony." Wolf’s first 18 months in office were weighed down by deeply entrenched disagreements between his administration and Republicans who control the legislature. Much of the fight centered on Wolf’s first budget proposal, which included a bold proposal to raise the income and sales tax rates and use the money to reduce local property taxes. The legislature believed Wolf’s plan would hit taxpayers too hard in the pocketbook. The two sides battled for months, leading to a historic nine-month budget impasse that soured political relations and strained schools and institutions that provide services for those in need. Realizing his administration was not going to win using a combative approach, Wolf switched tactics midway through his first term, homing in on issues and policies on which he and the legislature could find common ground. He and legislative Republicans ushered through changes to pension benefits for future state and public school employees, legalized medical marijuana, boosted funding for public schools, strengthened animal welfare laws, and broke the state’s long-held monopoly on the sale of wine. The two sides also pushed through restrictions on gun access for some people facing domestic-violence allegations, as well as measures aimed at improving the criminal justice system. During his 16-minute speech, Wolf paused to recall what he described as the “toughest day” in his four years as governor: the day last October he learned of the mass shooting at the Tree of Life synagogue in Pittsburgh. The governor recalled how he and his wife, Frances, rushed from Beaver County to the shooting scene, where they also encountered legislative leaders from both parties. “In that moment, we weren’t Republicans or Democrats. And, for that matter, they weren’t legislative leaders and I wasn’t the governor,” Wolf said. "We were just like everyone else, feeling helpless and heartbroken." “But in the days that followed, the people of Pennsylvania lifted us all up,” Wolf said. He later added: “We all came together. We all did what we could. We all leaned on each other. We all found the strength to carry on. ... That’s the Pennsylvania we should all want."